Why defining professionals through an occupational lens is not only antiquated, but counterproductive. Why a professional's mind-set is more important than his or her technical skills. Why people, despite the inherent responsibilities, willingly embrace the mantle that comes with being a professional. 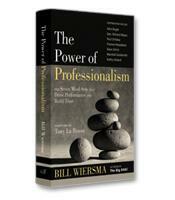 Why organizations whose members view themselves as professionals outperform, outsmart and outlast other organizations.